I first met my dear friend, Shelly Ogden in the most unfortunate setting; the hallway of a hotel in St. Petersburg, FL after our first session of the NTSAD Annual Family Conference in 2010. We were both attending for the first time. Miss Elliott, who had infantile Tay-Sachs and Kaleb, who had infantile Sandhoff were nearly the same age, and had both recently been diagnosed. What I remember most clearly is Shelly stopping me in the hallway and telling me that she just wanted me to know that I was saying all the same things in that session that she was feeling, but couldn’t bring herself to say. The thing about living with these rare diseases, and impending loss is how instantly, and how intimately the bonds we parents forge are. Both Miss Elliott and Kaleb died in 2012, and while Miss Elliott died in February, Kaleb died on October 3; Miss Elliott’s birthday. Shelly texted me early that morning to let me know that Kaleb must have wanted to go be with her to help her celebrate. I was gutted for her. And the thing about outliving your medically fragile child, is that in many cases you’re suddenly, nearly completely lost. When your everyday life revolves around continuous care, medications, positioning, appointments, therapies, etc., the silence can be deafening. Constricting in your lungs like a lack of air leaving you writing in pain, desolation, and despair. “I ran away and joined the circus after the death of my son. Okay, not really, but let me explain. Kaleb had infantile Sandoff disease and died just eight days after his fourth birthday. Grief can consume you, especially when you are grieving the loss of a child, if you let it, and I was determined that I was not going to let it. I never wanted my surviving child, Christopher, to feel like his life was less important, so I decided to show up for him, and continue to live for Kaleb, who didn’t get that chance. Even when I didn’t want to do it. Even when it was a struggle to make myself do it. I owe that much to the rest of my family – and also to Kaleb. After his funeral, when family went home, and Dave went back to work I had nothing. I felt lost. I felt like I was wandering without a purpose. I’d go window shopping to kill time but even that was too hard. I’d see a mom walking with her son and I’d literally have to run out of the store or risk breaking down in front of everyone. I then found myself making daily trips to the cemetery because that is where I felt close to him, and because I couldn’t stand being inside our empty house. On my way back from one of those trips, I stopped into a women’s only dance studio and bought a membership. I decided it was time to start taking care of myself. I thought I’d start off easy and attend an aerial yoga class, but when I got there, the instructor warned me that what I was about to take was an aerial silks class. I was already there, and I didn’t know the difference, so I decided I’d stay. Little did I know what I was in for. I am a retired law enforcement officer, and I’ve been through some tough training but this class was the most physically demanding thing I’d ever done. First and foremost, I am afraid of heights which was a challenge. The silks physically hurt my feet, and my forearms, hands, and biceps felt like they were one fire. My entire body was screaming, but for one hour I found that I could focus on something other than the pain in my heart, and that was an amazing feeling. One thing I have discovered, as I dove head first into the world of circus arts, is that the more I learn to “fly” the closer I feel to Kaleb, I no longer feel the need to visit the cemetery every day. The friends I have made in the aerial world are some of the most supportive and caring people I have ever met, and they’ve changed the way I look at a lot of things. My first instructor, Jessie, played such an instrumental part in my healing process. There are countless times when she would sit with me and just let me cry on her shoulder, which was very therapeutic. She’d encourage me to join class when I was ready during those difficult days where I felt like I was constantly on the verge of tears, and I always felt better out of class. This past August, I asked my current instructor, Lauriel, to choreograph a piece for me to Danny Gokey’s “Tell Your Heart to Beat Again”. I told her I wasn’t the kind of person who could perform in front of an audience, but I wanted to record this piece and post it on social media in honor of Kaleb’s angelversary. I explained that this anniversary would mean that Kaleb would be gone, longer than he lived. What she came up with was even better than what I expected, and was packed with so much emotion. I was so proud of what she had done and when I finally got it recorded we sat together hugging each other and crying. The release of having finished it, was more than just finally recording the piece, but the emotion of the song and the action that was put into the routine all hit me at the end. I have always been the quiet observer, the wall flower if you will. I like to see everything going on around me, but I prefer to stay out of the lime light, until recently when Lauriel talked me into performing. I stepped out of my comfort zone and become a performer equipped with identification that titled me “Talent”. So, for one night, I joined the circus, and the spotlight was on me. It was oddly both terrifying and exhilarating at the same time. I was bolstered by the fact that my oldest son and husband were in the audience to support me and I know Kaleb was in the air right next to me. This entry was posted in Child Loss, Grief, Mourning, Women's Lives and tagged Child Loss, Faith, Family, Grief, Health, Inspiration, Life, Motherhood, Women on August 16, 2017 by Becky Benson. McKenzie Johnson is someone to look up to, though she, herself would be uncomfortable with the moniker of role model, it’s true. I admire so much about this woman and what she has overcome in her life. A grief counselor once told me that we need to be good stewards of our grief, meaning that instead of allowing it to swallow us up and tear us down, we can use our experiences to help others facing similar trials. And likewise, Mac is a good steward of her pain, even through the struggle of overcoming addiction. In my opinion it’s the individuals who have been through various forms of hardship who have the most to offer. It’s one thing to live your whole life on top, but it’s quite another to be writhing in the depths of despair at some point, and to choose to claw your way up to the top instead. That’s just what Mac does, every day. She literally climbs mountains, and somewhere along the way she found her voice, herself, and even though she wasn’t looking for it, she found love. “Just over a year ago I wrote my first guest piece here, Numbing the Pain. In the past year a lot has changed, and a lot has stayed the same. My mom still has cancer, I am still in recovery, I still find it hard to show emotions to those closest to me, my past still haunts me from time to time. I have climbed Kilimanjaro; and found love doing so, I am building a home, I have become an aunt, I have left my job for the time being. I have stepped into many unknowns, and all my expectations have been blown away, like they usually are. I was reading an interview with Pamela Abalu and her parting statement was, “fear is imagination used for the wrong purpose”. How true that is. When you have a loved one with cancer, and you yourself have the disease of addiction, there is a lot of fear. In fact, I think fear drives us all in ways we may not even realize. After almost five years of being sober my fears have evolved from say, wondering if I would wake up the next morning, to am I enough, have I done enough, am I treating my loved ones in way that I am proud of, will anyone find out that I am making it up as I go along? They say addiction is a family disease, and it’s true, I know it from experience. I know now the many ways in which this disease of mine affected the people I love most. And I only know this after finally being forced to acknowledge it in treatment. I would say cancer is also a family disease, affecting all those around the one with the symptoms. Mom has always understood me as a being, knowing things about me before I was ready to acknowledge them myself. In my teenage years, before I was an active alcoholic, I was deep in an eating disorder, anorexia and bulimia. One day she pulled the car over in our neighborhood, looked me straight in the eye and said, “I know what you’re doing to yourself, do you want help?” I said “Yes,” I still see my therapist she found for me. The same one who many years later would look me straight in the eye and say “You would benefit from inpatient treatment.” And I did. I see her tomorrow. Mom would hand write me letters in college, saying that if I ever needed help with drinking that they were there. I would throw them away. I wish so badly I had one of those now. Mom is the type of person who if I cry, she cries, and not just because I’m her daughter. She’s most empathetic person I know. She will move mountains for people and causes she cares about. She is soon to start her fourth treatment in five years, this time a deadly yet potentially curative cocktail of chemo, immunotherapy and a stem cell transplant. There is nothing easy about what the next six months or more will have in store for us. There is nothing to really prepare any of us. There have been days where I thought I would implode. Around treatment time my depression and anxiety flare up, my thoughts of alcohol increase, fear is a constant companion. Work has been hard to manage, a new relationship has helped so much although has its own stressor of distance. But the process for me this time has been different; I have been more present, going to appointments, helping make decisions, telling mom the sometimes-hard truth that she does not like to hear, and looking at things from a different perspective. I’m focused. Sometimes, the closeness of others and the reality it brings is still difficult for me to swallow so I show my love in different ways, like raising (a considerable amount of) money for the Leukemia Lymphoma Society again this year through the Big Climb. Events like these help me to channel my energy and desire to help in a positive and productive way, as much for myself as for the one I’m helping. I cannot say that I am a natural caretaker or the best person to be at your bedside, but I am a good decision maker, can ask hard questions and maybe push my mom a little more in areas others wouldn’t, just as she’s pushed me. She can be tougher than she knows. I’ve learned that I can be, too, but I still won’t cry in front of her. In being more present for my mom and family, work has seen me through more than a few breakdowns recently. Again, being vulnerable in front of people who are not my loved ones is far easier for me than showing those who should be closest to me what I am feeling. I run a team that does over a million dollars in sales a year, I was assisting on teams doing over six million a year before I got my own. I have always put immense pressure on myself to be the best at everything I take on, my therapist would say I am a perfectionist, and I am not ok with being “ok”. I have a hard time saying “no,” and an even harder time asking for help. That’s part of the reason I climb. To get my mind frame out of focusing on the constant pressures I inflict on myself, to get out of my head, to just breathe. Having a partner to balance and support me, to point things out that I miss, to have a different outlook on things; a healthy perspective has made a world of difference. I know that I should not go through this alone, but I have a disease that wants me to isolate, that will creep in through any vulnerability. If I have learned anything in recovery, it is that we cannot do it alone. This time I didn’t. I asked for help, maybe a little too late after one too many things were put on my plate, but I did and I am proud. The last and only other time I took a significant amount of time away from work was when I went to treatment for my alcoholism. All in all, I was there for five and a half months. I then chose to live in the nearby community for a few months after that. It was the best, and hardest decision I have ever made. If you would have asked me a few months ago what could possibly take me away from work, my answer would have been, The Pacific Crest Trail or travelling the world for a year, but what has taken me away is that I am taking this time to take care of myself, and my mom. I don’t want to have to go to treatment again, I never want to have to tell my family I relapsed. I have a constant fear of this, and it is truly terrifying for me. I was never the little girl who dreamed of finding a husband, getting married, and having kids. I have always been independent and self-sufficient, almost to a fault, living my life in near protest of it, almost as if I had something to prove. Or maybe just something to hide. I always knew that if I did happen to find that person it would have to a partnership, and someone who understood my independence, wasn’t scared of my past, could live with my current lifestyle of not being around alcohol, could draw my thoughts and feelings out, allow me to cry, to be the tough one, to celebrate my success and not be intimidated by it, make me want to share my life, and let me climb the mountains I love so much. I found him, on the tallest mountain in Africa. When we first met I thought he was handsome, kind, quietly confident, self-assured and aware, and I remember not being able to tell how old he was. Over the next few days I was stuck by his patience, his ease with the locals, culture and language. He led our group of four incredibly independent, strong, wickedly funny, successful women without so much as breaking a proverbial sweat. We were on the mountain for seven days. He later told me he knew he loved me at camp two. But at camp two I was busy trying not to let my feelings show, maybe so I didn’t even have to acknowledge them myself. That day we all took a popular little side trip from camp. It was very busy and I was having some anxiety being around so many people, and the hike made it worse, I think he noticed that. When we returned to camp I heard him say to another guide, “I’m going to take her on a separate hike, she’s very active.” That awareness and kindness wasn’t lost on me. Our little hikes became a theme for the rest of the climb. This is where we really got to know each other, just the two of us, on little side trails on Kilimanjaro. After the climb, we convinced him to join us all on safari. Following that, we both happened to have tickets to Zanzibar, so there we were able to spend our first time alone together. I have never had something feel so easy, right. In the following months, that has not changed, though so many things have not been easy. He was working and living at Crystal Mountain, me in Seattle. And now he is in Alaska, and me, in Seattle. But he has never once shied away from me, as I have with him, first because of our age difference (he is considerably younger than me), then distance, then because anytime I let someone get close, I try to push them away. This entry was posted in Health, Inspiration, Life and tagged Addiction, Family, Health, Inspiration, Life, Love, Pain, Relationships, Sobriety, Women on May 15, 2017 by Becky Benson. As a mother, there’s not enough bubble wrap in the world for my liking. If I could have an infinite supply to wrap my daughter in for the duration of her (very long, and very happy, I hope) life, of course I would. Like I said, I’m a mother. Such is not reality. And in any case, I am aware of how that would prevent her from having as many good experiences as it would cushion the bad, I would assume. There’s never an easy way to find the right balance of letting go and letting grow, to protection and inadvertent smothering as a parent. Three weeks ago a call came from my sixth grader’s school that she had tripped and fallen in PE while playing soccer. The teacher had helped her up, dizzy and pale. Realizing there was something to be concerned about given her reaction he lead her, slowly, up to the nurse’s office and immediately called me at home. As I sped through the neighborhood at Mach Ten, daring someone to glare, gesture, or any police officer to pull me over, I was there practically before I had hung up the phone. My girl is a trooper. She never cries or complains, to the point that when she was younger we would have to tell her that it was okay not to be okay, and she needed to let us know so that we could help. A hard-headed quality that she comes by honestly. And she’s resilient. Thanks in no small part to her sister’s terminal illness and death. That, of course is something that I never expected her to have to endure. Something that has most certainly shaped her young life in myriad ways, and will remain with her forever. Haven’t we all found our children’s childhood’s shaped by unseen factors that we never planned for and most certainly hoped to avoid? But alas, steel is only tempered by fire. Most parents of children who have passed seem to feel a heightened level of fear, be it rational or irrational, over the loss of their other children. That’s not so far reaching, if you ask me, merely a product of our experiences. A trip to the sports medicine clinic, a few X-Rays, (broken radius) and a nice purple cast later we were on our way. It was a clean break, and a routine set. Everything was right on track, until two weeks later when another X-Ray showed the bone veering off course and not reattaching correctly. We were informed then that the next step would be surgery. I may have been in actual shock to hear this and the wheels began spinning in my head. I was upset. Terrified, and thoughts of doctor’s offices, bad news, and hospital visits with Miss Elliott flooded my memory. We had had enough of all that to last a life time, but not with Skylar. She was my healthy child. I tried my best to remain calm in front of her. I didn’t want to further upset her with my own hysteria, and I needed to rein it in for my sanity’s sake as well. Two days later at six am we were in the hospital prepping for surgery. I was nervous of her undergoing general anesthesia, as she never had before. She had never had anything wrong before, ever. I tired to hide my tears as they wheeled her back, IV in her arm, swimming in the hospital gown they put on her, and walked out to the waiting room. I had brought a book, although I knew I couldn’t focus long enough to read a single sentence the moment I took a seat. She was now a color coded number on a monitor in the corner of the room, to which my eyes were fixed. It would tell me when she left the surgical prep room for the OR, and then once she was moved to recovery. I watched that screen like a hawk. Shaking with nervousness so profusely that a receptionist mistook my jitters for being cold came over to offer me a blanket. In just thirty minutes, that felt like nothing short of an eternity, she was already being wheeled into recovery and the nurse was calling me back as she was waking up. A new blue full-arm cast encasing three pins now covered her newly set arm. She was groggy and in pain, but she was ok. As another Tay-Sachs mom put it, “Hope she feels better soon, sad for her but happy for you as a mom she has something fixable”. I was certainly thankful for fixable, too. This entry was posted in Health, Uncategorized and tagged Family, Health, Life, Motherhood on May 24, 2016 by Becky Benson. They say it only makes it worse when you finally feel it. Addiction is a prison of its own making. A cycle that’s hard to break, to say the very least. And when loss or grief is added to the mix the welling up of emotion surrounding the issues at hand often seem to propel one further into that cycle, before if ever, propelling them out of it. Mackenzie Johnson is the daughter of a dear friend, Lynette Johnson. You may have seen some of my writings referring to Lynette in one way or another before, but you’ve undoubtedly seen her pictures. Any of the photographs of my family on this site are Soulumination photos. 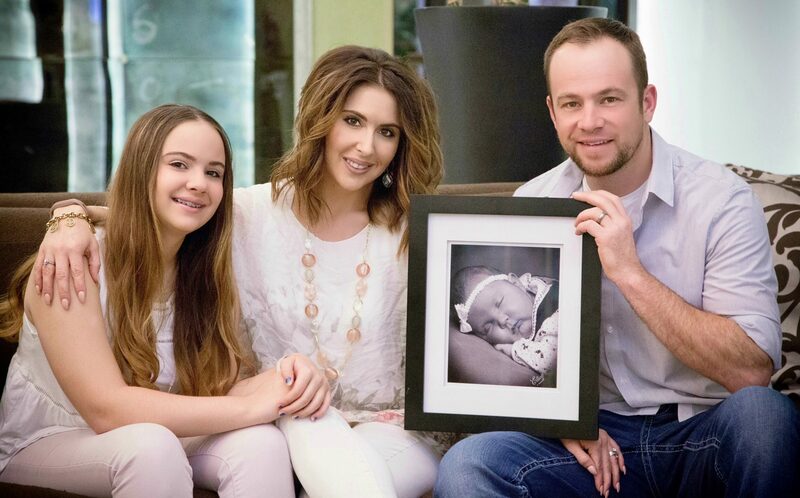 Lynette is the founder of this wonderful organization that provides the most lovely, candid, real-life photo shoots, free of charge for families of terminally ill children. Families like mine. I met Lynette when living in Seattle, shortly after Miss Elliott was diagnosed with Tay-Sachs disease. A friend I’d made online, another mother of a child with Tay-Sachs had recommended I contact Lynette and Soulumination for photos since we both lived in Seattle. I found out that Lynette had traveled to the National Tay-Sachs and Allied Diseases Association’s Annual Family Conference nearly every year, and that she had personally taken the photos of nearly every family in this community across the country, and here she was right in my own backyard. This vibrant, caring woman who was such a bright and shining light of positivity in the lives of so many families suffering through anticipatory loss or grief itself, was stricken with Cancer. And what’s more, at the same time, her daughter, McKenzie was suffering through the depth of years of addiction and unable to come to terms with her mother’s illness. In her own words below, Mac describes the process of finally feeling all those feelings she strove so hard to keep at bay for so long, and the impact they have on her now as she’s navigating her way through feeling them authentically and coming to terms with (and finding out) who she is. “For years and years I wouldn’t let myself feel anything. When one drinks it shatters and suppresses all feelings, the good and bad ones. I did not realize exactly that this is what I was doing. It was a long time in the making, but eventually I found that out for myself. All those years later when I got sober, it was the pain that hurt the most. Foreign and new it crept in and for the first time, I was powerless to stop it. Pain over the realization of what I had done over those years, pain over my mom’s recent cancer diagnosis. Pain over deaths I never allowed myself to grieve. When my grandparents died one by one, I hid away, not able to join in proper grievance, for alcohol was my comfort and my pain. My last surviving one shares in my disease. It goes untreated, and still I cannot connect. I knew I drank differently from the very start, I also was aware that I was highly susceptible to becoming an alcoholic. I was already familiar with it because it runs in both sides of my family. Once I started drinking I could not stop. To have one or two drinks is impossible for me. Soon I was drinking every day. I noticed that I was different from most of my friends; my tolerance was greater and I had no end point. I would drink until I passed out. This kept me from visiting much or living near my family. I did not want them to be around this, to know this part of me. I also did not want them to try and stop me, and I knew they would. I made myself independent in every way so they could have no say in the way I lived my life. Until the way I lived my life would lead me very close to death. When I found out my mom was diagnosed with lymphoma I got drunk immediately after getting off the phone. I maintain that my mom’s diagnosis got me to such a bad place that I finally accepted the help that had been long offered me. One day soon after, I woke up in my boyfriends’ bed, where I had not gone to sleep and I looked down at my wrist. It had happened again, a hospital bracelet. And no memory of it. I went to my phone and texted my sister. My recollection of that text is send me anywhere you want. It probably did not say that exactly. I then poured myself what I knew would be my last drinks. I was passed out by the time my sister had flown in that afternoon. I was living in California when my sister came down to pick me up. We were going to a treatment center in Canada. I refused to stop in Seattle overnight because I thought I would change my mind about going, but I said we could still stop for a moment just to see mom. We stopped at our childhood home. Mom came out, very weak, sick, and bald, using a cane. She hugged me and whispered in my ear “I’m so proud of you.” How could she have been proud of her alcoholic daughter? At the time it surprised me, but gave me hope. It was not until much later that I knew exactly what she meant. I’ve been sober for almost four years ago now, but the feelings didn’t flood in for me. They have never come easy for me. I’m still finding them today, still finding ways to express them. I still don’t like to feel them sometimes. I like to shove them away, to not show you that I can be vulnerable too, that I have feelings too now. I can cry in front of complete strangers, but not in front of my family. I struggle with relationships with those who are supposed to be closest to me, for it is them who can see the real me. And sometimes I am unsure of who that really is. Vulnerability is a scary word for me, when it should be one of empowerment, strength, beauty. But a part of me struggles and believes being vulnerable to be weak. What will happen to me if those I love see my weaknesses, my feelings, my shortcomings, struggles, my pain? They will only love me for them I am sure. After all these years of struggling with acceptance, I know that I still haven’t let my feelings on my mom’s diagnosis fully surface. It is hard for me to listen to her talk about it. I refuse to touch her nodes when she wants to see if they have grown. I don’t know why. Maybe if I don’t then it means it isn’t real, that I can disconnect a little longer, protect myself from the pain. She has been through treatment twice now and will more than likely venture into a third in the near future. When I agreed to my own treatment she was already in chemo. She was very weak and very sick, so sick that she vows she will never do chemo again. I honestly believe she would rather die. McKenzie is raising money for her mother’s Big Climb effort to benefit the Leukemia and Lymphoma Society in their continued dedication to fund research for a cure. You can join Mac at the website below and offer your support as well. This entry was posted in Health and tagged Addiction, Family, Health, Life, Mental wellbeing, Support on February 28, 2016 by Becky Benson. It’s a phrase you hear uttered, often in breathy and exasperated annoyance by someone wishing they had something glamorous or adventurous waiting for them outside their door. The monotony of the mundane in which they view their lives has worn them down, and their restlessness and agitation lies in the fact that they perceive that they aren’t being stimulated beyond their daily routine. We all want excitement, newness, and even some grandiose experiences from time to time to spice up our lives, which we so often tend to regard as boring. There’s nothing wrong with wanting to alleviate the tiresome and repetitive nature of our daily lives. Functioning out of obligation and expectation will wear on anyone over time, but if you can’t rejoice in the monotony of the mundane, what makes you think you deserve the extravagance of the extraordinary? It’s so easy to say that we shouldn’t take anything in our lives for granted, that it’s practically cliché. To say that we never know when we will lose something important is again clichéd. And for as true as it is, it’s hard to remember sometimes. We all know it logically, but it can difficult to put into practice. It’s an exercise in perception. Do you choose to focus on what you do have, and relish in the joy of your blessings? Or are your so negatively focused, complaining over that which you do not have that you completely forget to acknowledge the good fortune you’ve already been rewarded with? If you tend to lean toward the latter, you may unfortunately be bringing about the dissatisfaction in your own mind with your very mindset. “I would give anything for a boring night at home.” My cousin’s husband spoke this simple sentence to me last weekend as I visited them at the respite center of the children’s hospital where their six-month old son lay in a room fighting for his life. Attached to a ventilator and fitted with a chest tube, he was stricken, not only with rhinovirus, and parainfluenza, but a very rare blood disease known as Hemophagocytic Lymphohistiocytosis (HLH) as well. As of right now he is undergoing chemotherapy, but may also need a bone marrow transplant in the near future. To say that these last few weeks have been difficult would be a vast understatement, and sadly, they have been anything but boring. I know, first hand how my cousin feels when she and her husband wish for a boring night at home. I know how she feels to watch helplessly as her child fights for his life. And I know how hard it is to stand by and not be able to lift a finger to help him in any possible way. Talk about a change in perspective. It’s impossible to concern yourself with anything else when facing your child’s fight for his/her life. Noting else maters. All the shamelessly unimportant details in life melt away. You never care if you ever go on another fancy vacation, or eat at an expensive steakhouse for dinner. You don’t need elaborate gifts, new clothes, material possessions, or nights out on the town. Your only want is for your child to live, and if you had to crawl into a cardboard box and live out your days without a penny to your name you would gladly do so if it would save your child’s life. Astoundingly, people may be unreasonable, unkind, and even unsympathetic to your plight. Even those who are closest to you, those you expected to be there for you and for your child in a situation of such magnitude, but it doesn’t matter. Suddenly you don’t have the time or the energy or forethought to worry about them. Those problems are too minute, too boring, and before you know it your life is anything but. I felt helpless for Debbie and Travis as we sat in the inpatient waiting room taking turns, two at a time visiting baby Jaxxon. No one ever expects to be in those shoes. No one can ever plan for being in those shoes. It’s complete and total blindsiding being hit by such a monster. 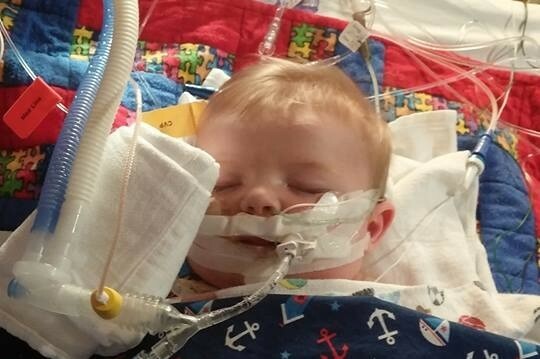 At six months of age, no one ever expects a seemingly healthy baby to suddenly be in a fight for his life. Since being whisked from the E.R. and processed into an inpatient, baby Jaxxon has been completely incapacitated. He has been put on medication that causes temporary paralysis as well as heavy sedation. Three days ago, as the doctors attempted to take out his chest tube, his left lung collapsed, and set him back even further. He began his chemotherapy last week and will have two rounds per week for eight weeks. If the medical team can get the HLH under control and stabilize his breathing, they can begin to treat the infections with a heavy dose of steroids. Jaxxon is most certainly not out of the woods yet, but his care team is keeping a close watch on him and helping him make it through all this. He’s just six months old I kept thinking to myself. So young and so seemingly healthy. My knee jerk reaction is to say that I “can’t imagine what his parents are going through”, which when said, more accurately represents the fact that the subject does not want to have to understand. The thought of something happening to your child is so appalling that you can’t even force your mind to go down that path. Unfortunately, to some extent I can imagine. Debbie said to me that she has so much respect for me as a mother for what I went through. She also told me that now she realized what it feels like to see you child struggling with such a horrific circumstance. My heart ached deeply for her. I knew she meant these words above and beyond mere platitudes. She felt them in her heart because it’s true, you just can’t understand the tribulation and the feelings of helplessness unless you have lived through such an experience yourself. I just prayed that she will never have to know the extent of the hurt and pain that I live with every day. I told her that we have hope for Jaxxon, and that’s all we’re going to focus on. 1. Offer. The person needing help usually won’t ask for it. Bring a meal, do laundry, babysit, run errands, set up a medical condition website site to notify people of what’s going on, etc. 2. Don’t back away because it’s hard for you. That doesn’t help them. It’s a slap in the face. It’s hard for them too and they don’t want to be in their shoes either. Just say “I don’t know what to say. I’m so sorry”. It will mean more than you know. Don’t make excuses. 3. Include them. Don’t assume they don’t want to know about your news, good or bad that you would otherwise share with them. They want to remain in your life and care about what is happening to you. They also may welcome the change in topic from their issues. 4. Be Respectful. Check in often, but if they want space, give it to them when they need it. 5. Listen. Don’t try to “fix” the problem yourself, just listen if they want to open up and vent. This entry was posted in Health and tagged Health on May 15, 2014 by Becky Benson. Even though I’m not old enough to go around saying “I ain’t no spring chicken anymore”, I’m certainly not a twenty something and I’m starting to feel my age catching up with me, or so I thought. I’m not that old…to quote the band One Republic: “Old, but I’m not that old. Young, but I’m not that bold”…anyway, I turned thirty last year and it just seems that weight, tiredness, and forgetfulness come with the territory. My mother suffers from Hypothyroidism (underactive thyroid), and I had recently started to wonder if I may be starting to show symptoms of this as well. Things like this tend to pop up as we age, right? As I looked up the symptoms, which included, tiredness, weight gain, and even the inability to be able to stand the cold (I really have that one, bad), it sounded like the nail was being hit right on the head, and it also said that it often goes undiagnosed because of the attributing the symptoms to age itself. I made an appointment to have my levels checked because I want to make sure that as a mom, I’m not too busy caring for everyone else, that I forget to care for myself. No one is ever happy with not feeling their best, that is, the idea they hold of themselves of what their best either is, or could be. One of my friends once told me that we don’t always compare ourselves to others (friends, TV, magazines), we compare ourselves to the idea of the best ‘us’ in our heads. It’s oddly interesting how our body image can take up so much room in our consciousness and become one of the pieces of the foundation of who we are. We often hold ourselves hostage to an unrealistic standard of beauty or weight or whatever imposed on us by the media, as well as our own comparisons to who we were when we felt our best, and allow it to all get wrapped up in our sense of self worth. For me, that ‘best me’ would be the me I was when I was a seventeen year old senior in high school. Young, thin, and my whole life ahead of me. I’m 5’3″ and back then I weighed 112-115 pounds. Why would I now, as I thirty year old woman, even compare myself to the child I was in high school? Haven’t I changed in mind and spirit sense then, and gladly embraced those changes? Why would I still hold out mentally for my physical past self? Are we or are we not more than just the sum of our parts? As of this very morning, I weighed 126.2 pounds. I know, I know, no shock and awe. I get it, that’s not a lot, and no, I’m not overweight. I seven still wear the same size I wore back then, but It’s not the ‘me’ I feel like I am. My weight has always been pretty steady, never fluctuating more than a few pounds, even after having two children. I’m currently about six pounds heavier than I typically tend to be, which is the heaviest I’ve ever been as an adult (save pregnancy) and even with a healthy diet and exercise (which I detest, but try to keep up for the sake of my health), I just can’t seem to make that number come down. Trust me, I’m not looking for sympathy for the skinny girl here, it’s just that for me, this isn’t the me I want to be. The tiredness, the constant run-down feeling, the scatterbrained forgetfulness of my daily tasks. This had never been me and I don’t want to just sit back and accept that it has to be who I am now. Is there another explanation for it all? I think that most of you who read this blog are aware, but for those of you who aren’t, you should know that this blog is a rolling account of our life since our daughter’s passing. Last year, I wrote a book about the wonderful blessings that were the lessons I learned in her three short years of life, hence the blog title. In pondering these physical issues I began to wonder if any of my fellow grieving mothers have been experiencing any of the symptoms I have been. I certainly wasn’t prepared for the firestorm of comments that came flooding across my computer screen when I posed this question on a board in our online grief group. My daughter died of a very rare genetic neurological condition known as Tay-Sachs Disease. The woman who are a part of the grief group I mentioned have all had children pass of either Tay-Sachs itself, or a related genetic condition, so they have all come to experience loss in the same manner that I have. Nearly ever single woman on the feed echoed the words of the others. Almost any one of the responses I received, I could have written myself. The continuing effects on their health since their children’s passing was a reflection of the sentiment expressed by everyone else in the group, and none of these symptoms had been present before their children’s deaths. Maybe my symptoms, to which I attributed to growing older, or even other issues, such as Hypothyroidism, were really a manifestation of my ongoing grief. It’s comforting, even if unfortunate, to know that someone else out there understands how you feel because they are experiencing it for themselves first-hand. In this way, we know that they not only understand logically what it would be like, but they know through living it what it is like. From The sleeplessness, to the tiredness even if you can sleep, the body aches, weight gain, hair loss, anxiety and panic attacks, even outbreaks of hives, our grief is most definitely being manifested physically. We focus so much on our mental and emotional health after a death, that I think, it’s easy to forget how it can affect you physically too. The stress accompanied with this kind of life event can be crippling and not just in the first few days and weeks afterward.. When I first broke out in hives, around six months after my daughter passed, I tired everything to remedy them. Nothing, not Benadryl, Cortisone cream, not even Calamine lotion would calm them. After suffering for nearly a month, it got to the point that I couldn’t sleep. The sheets scratched my body so badly that I couldn’t rest. My hair, my clothes, it was agony for anything to brush against my skin. I scratched relentlessly, ripping my skin apart and covering my body in scabs. I finally went to the emergency room when I couldn’t take it any longer. They ran a battery of tests and asked all kinds of questions about the detergent I used, where I had recently been, and even what I had eaten lately. They ran allergy tests that showed nothing, and eventually they came to the conclusion that it was stress related. I didn’t believe them. I didn’t even feel stressed. I was carrying along just fine, just like I always did. A prescription for a very strong anti-itch cream, and a steroid finally cleared up my hives and went about life just like I always had. It wasn’t until a year and a half later, when I had another bout of hives (after an admittedly stressful experience) that I finally realized this was my body’s way of reacting to the stress I was continually stuffing down inside. As mother’s there’s no time for us to get sick. There’s so much to be done every day, that there’s often no time to acknowledge what we’re dealing with personally. When everyone else needs something from you, your reserves for helping yourself have all been depleted by the time you get around to doing so. Then, there’s no time to sit around and feel sorry for yourself about it, so you just keep chugging along. I couldn’t believe that other grieving mother’s had even experienced outbreaks of hives as well. I couldn’t believe how closely all of our issues mirrored one another at all. Our grief has been wreaking havoc on our bodies in the years since our children have passed away, sometimes even without our realizing it. Grief can wreak havoc on all facets of your life. No one has a prescription for a magic fix to these problems. This is the reality of living with extended grief. There is no magic cure for grief and it’s symptoms, there is only learning to not let it overcome you. It takes time to understand the hold grief has on you, and it’s severity can grow and change over time. Though we hope that as it changes it shrinks and holds on to less of us, when you lose a child, it is not a hut that can ever be healed, only one we can try our best to manage as we will live with it every day for the rest of our lives. This entry was posted in Life and tagged Grief, Health, Life, Wellness on February 26, 2014 by Becky Benson.